Bhubaneswar: Noted researcher Anil Dhir urges Odisha Chief Minister Naveen Patnaik to keep Biju Babu’s Old Dakota to Bhubaneswar instead of Cuttack. Mr. Dhir said if the Dakota is kept at a suitable place outside the Biju Patnaik International Airport, nearly 20,000 visitors will see this great relic of bygone days each day, and realise Biju Babu’s contribution for the aviation history of the nation. 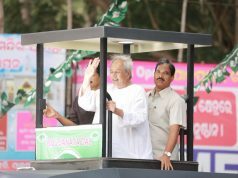 Hon’ble Chief Minister of Odisha. 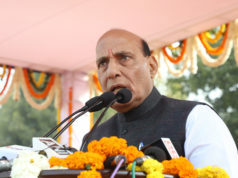 I am writing to you in the matter of the Old Dakota aircraft that is lying at the Kolkata Airport and which is being brought to Odisha because of its connection with Biju Babu and Kalinga Airlines. I have been making efforts to bring the aircraft to Bhubaneswar since the last five years and have written to you many times. As a pilot myself, I know what the old aircraft means to the legacy and heritage of the late Biju babu. I had given up hopes of getting it to our State, but due to the efforts of a few friends I was able to piece together the history of the plane and relocate it at the Kolkata airport. I had personally inspected the plane and confirmed its registration. The co-operation of the Chairman of the Airports Authority of India, Shri Guruprasad Mohapatra is laudable. It was heartening to hear that efforts are underway to get the craft to Odisha. 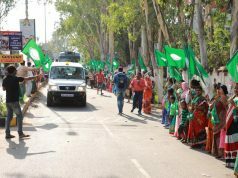 It was also reported that the plane would be brought to Cuttack and kept in the Anand Bhavan Museum. In this context I am writing to you with the earnest request that the Dakota should be got to Bhubaneswar and should be suitably parked in front of the Biju Patnaik International Airport instead of Cuttack. The right place for an aircraft is an airport, just as the correct place for an old Railway Engine is outside a Railway Station. Please understand that there are very few Dakotas on display in the world. Most of them are in air museums that are attached to airports nearby. Nearly 35 of them are displayed outside prominent airports all over the world, mostly in the United States of America. Sir, the DC-3 Dakota was, and still is, unique. No other aircraft has cruised every sky known to mankind. It has been admired, cherished, glamorized, and given many tributes. It has flown more miles, broken more records, carried more passengers and cargo, accumulated more flying time and performed more “impossible” feats than any other plane in history. The Bhubaneswar airport is presently operating 27 flights a day, if we calculate the inward and outbound movement, passenger traffic of nearly 8000 persons each day along with another 10,000 as visitors. Roughly 20,000 foot falls happen at the airport each day. 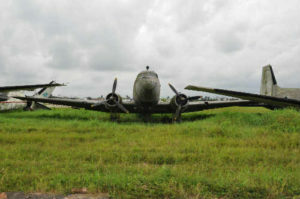 If the Dakota is kept at a suitable place outside the Biju Patnaik International Airport, nearly 20,000 visitors will see this great relic of bygone days each day, and realise Biju Babu’s contribution for the aviation history of the nation. At the Cuttack museum, there will not be that many visitors in a whole year. Please note that no other airport in the country has a Dakota parked in its façade. It will be a suitable and fitting tribute to our legendary aviator Biju Babu, to have an aircraft that he had piloted kept outside an airport named after him. The Airport Authority of India will be only too happy to this proposition. For them, the Dakota will be a suitable icon of the aviation history of the nation, and will be the feather in the cap of Bhubaneswar International Airport. I can understand that there may be political and emotional compulsions for taking the Dakota to Cuttack, but had Biju babu been alive he would have preferred it to be outside the airport. I personally will be very disappointed if the aircraft is taken to Cuttack. While undergoing flying training at the Flying Club, there were many occasions when Biju Babu would walk up to the hangar and talk us. He had told me many fascinating stories about his flying days. I am writing a book on Biju Babu and his Kalinga Airlines which I hope to publish soon. I have tracked each and every one of his aircrafts and written about them. Many World War II pilots have written about Biju babu, I have compiled the extracts and many hitherto unreported stories and anecdotes will be revealed. The Dakotas had many affectionate nicknames. The Americans called it the Gooney Bird, Old Fatso, Skytrooper, Placid Plodder, Dizzy Three and Tabby. While the British airmen called it the “Dak”, the Royal Canadian Air Force called them “The Flying Elephants.” The French called it, “The Beast.” Biju Babu, like many other pilots, used the term “Gooney Bird” for the Dakotas. While with Kalinga, this Gooney Bird has flown in and out of the Bhubaneswar Aerodrome many times. It will be appropriate that its final resting place is here. The most memorable description of the Dakota has been written by a former pilot, he wrote “It groaned, it protested, it rattled, it ran hot, it ran cold, it ran rough, it staggered along on hot days and scared you half to death. Its wings flexed and twisted in a horrifying manner, it sank back to earth with a great sigh of relief. But it flew and it flew and it flew.” It is said that if you ask any pilot how they started flying, you will hear a love story. 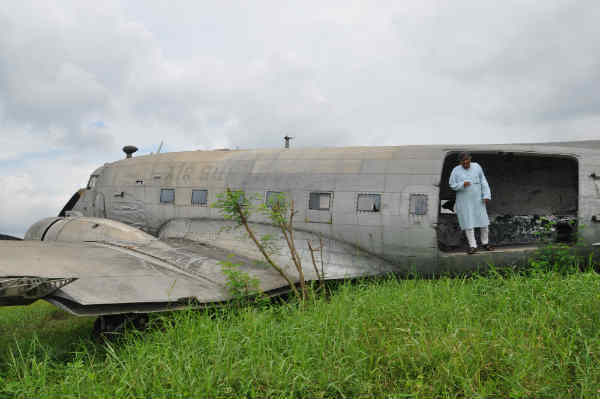 This old plane is a symbol of Biju Babu’s romance with flying, it may be on the ground since the last 60 years but its soul is in the sky. Let it be under the open sky, not cooped up in a small space. With the operational hangars of the State Aviation and the Flying Training Institute in the vicinity, it will be easier to maintain this old horse if need arises. Who knows, one day this Gooney Bird may take wing again. 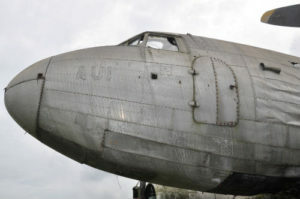 Both the engines are still perfect, and can be restored. I request you with all earnestness to please reconsider your decision and bring the aircraft to the Bhubaneswar Airport.